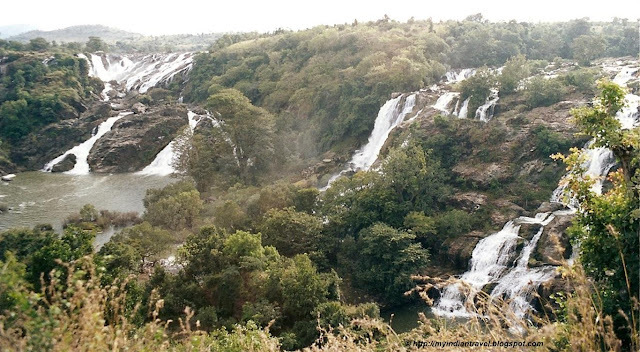 The beautiful Shivansamudra Waterfalls on the Kaveri River formed when plunges down through the rocks and ravines. During the rainy season this is a must visit place. Apart from this water falls here one can get to see the monkeys. Love those monkeys. The waterfall is spectacular. Is it one river or two rivers converging? That second shot is so cute adn they live in a wondeful place. Have a lovely weekend. The monkeys look cute and that's a beautiful capture on waterfalls! Mosura: It is a single river flowing over the rocks. Beautiful waterfalls and cute monkeys. Wow, such outstanding natural beauty. It's too dry where I live to get major waterfalls like this. And great wildlife too! Lovely creation of Mother Nature and Kaveri in all her splendor! I love the first view very much. The monkeys are cute too. Gorgeous landscape and adorable monkeys. Are they in a reserve or are they free to roam at will? Jack: The monkeys are not in captive. They are free to roam anywhere. Spectacular landscape and cute monkeys!